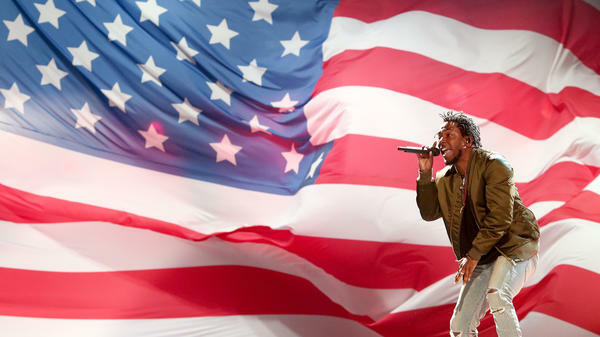 Kendrick Lamar performs at the BET Awards in 2015, the year his song "Alright" was released and exploded into an anthem of protest. The stories behind these musical manifestos — why they are written and how they are embraced — can reveal much about the cultural pulse of the societies that create, share and celebrate them. Beginning July 4, NPR will zero in on 50 different anthems across a range of themes: patriotic, civil rights, anti-war, female empowerment, sports, mental health and more, in a series we're calling American Anthem. Our working definition is "a rousing or uplifting song identified with a particular group, body, or cause," though each of our picks — selected by NPR staffers with help from a panel of music scholars and artists — might fill those criteria in a different way. Whether a song originated in America is less important than the role it plays in American culture (so expect to see a few from beyond our borders). From "Battle Hymn of the Republic" to "Lift Ev'ry Voice and Sing," "Dixie" to "Born This Way," we want you to think about what makes an anthem and for whom these compositions can speak. "Anthems demand something of their listeners," says panelist Shana L. Redmond, author of Anthem: Social Movements and the Sound of Solidarity in the African Diaspora. "These are songs that are meant to stir a certain type of belief in their listeners or their performers." As singer Judy Collins puts it, anthems are "a glorious reminder of our humanity," songs that "propel us to do the right thing." Of course, what qualifies as the right thing depends on your own definition of an anthem — and that's why we need your help. What's your favorite anthem? Tell us about a special memory of hearing or singing that anthem below. Your answer just might end up in a future American Anthem story. Digital editor Daoud Tyler-Ameen contributed to this report. The National Memorial Day Concert on the Mall in Washington, D.C., was held last night. And as is always the case when we remember our nation's fallen, we do it with a particular soundtrack. SPENSHA BAKER: (Singing) ...O'er the ramparts we watched, were so gallantly streaming? MARTIN: When it comes to expressing our collective emotions, anthems, like "The Star-Spangled Banner," are powerful tools. Anthems, as we've seen with the NFL, can also be divisive. This summer, NPR is going to take a close look at anthems of all kinds - patriotic, civil rights, sports, a whole wide range. Here to talk more about the series is NPR senior producer and arts correspondent Elizabeth Blair. ELIZABETH BLAIR, BYLINE: Hi, Rachel. BLAIR: You know, we're living in a time when people are actively talking about what it means to be an American. What values do we hold? People are taking to the streets in large numbers to express themselves, and music almost always plays a role. We saw this recently with the teachers' protests in places like Arizona and Kentucky. Here, teachers are singing at a rally in Frankfort, Ky. UNIDENTIFIED PROTESTERS: (Singing) We're not gonna take it. No, we ain't gonna take it. We're not gonna take it anymore. BLAIR: Sounds pretty different than when Twisted Sister sings it. MARTIN: Yeah, it doesn't so much sound like Dee Snider there - a little different vibe. But it's still really powerful, right? BLAIR: That's right. I mean, the sentiment still rings true, even though it's - that's definitely not heavy metal. MARTIN: How do we define anthem for the purposes of this series? BLAIR: So here's the dictionary definition for you - a rousing or uplifting song identified with a particular group, body or cause. So that's pretty broad. BLAIR: Anthems typically tap into the emotions of a community, whether it's anger or grief or pride, and the stories behind them can be quite complicated. Take a song like "Dixie." GID TANNER AND HIS SKILLET LICKERS: (Singing) Oh, in the Dixie Land where I was born, the early on one frosty mornin'. Look away, look away, look away, Dixie Land. MARTIN: A lot of people have a lot of different feelings about that song, right? BLAIR: That's right. Some see it as a rousing anthem of the South, but to others, it's a painful reminder of its blackface minstrel beginnings. MARTIN: All right, let's talk about Beyonce. She did an anthem that got a lot of people talking. This was at her much-regaled performance at Coachella. She did a version of "Lift Every Voice And Sing," often referred to as the black national anthem. Let's listen to some of that. BEYONCE: (Singing) Lift every voice and sing, till earth and heaven ring. MARTIN: You're going to look back at the history of the song, Elizabeth? BLAIR: That's right. We're definitely including "Lift Every Voice And Sing." It's another song with a very long history. And so we'll be looking at the origins of songs - when and why they were written, and how they were used at the time as anthems and how they're used today. MARTIN: There are so many songs, I imagine, that would qualify as an anthem with American significance. How are you selecting them? BLAIR: Well, we're still debating that. And we're trying to be inclusive across time periods, genres and themes. The songs are coming from NPR staff, as well as a panel of outside music scholars and artists. There are so many great songs. For example, the Vietnam era - you know, which ones do we pick? We're actually very eager to hear from the NPR audience about their favorite anthems and memories of singing or hearing an anthem. MARTIN: Well, it's going to be a remarkable series. I, for one, am very much looking forward to it. NPR senior producer and arts correspondent Elizabeth Blair, thank you so much. MARTIN: And if you would like to suggest a song for NPR's new series American Anthem, go to our website, and you'll find a form with all the details - NPR.org/anthem. BUFFALO SPRINGFIELD: (Singing) There's something happening here... Transcript provided by NPR, Copyright NPR.